I was literally naive when the annihilation of my family and one million more Rwanda’s Tutsi started in 1994. It all started exactly on this day, April 7, 1994. For many, this genocide is already a historical event belonging to the past. It happened a quarter century ago anyway. But for me, and other survivors, the genocide against the Tutsi in Rwanda is a past that is ever-present. No single week that goes by without nightmares and flashbacks of the horrors we have seen. And this is common to all the survivors I know. Every day we talk about the ones we lost. The best and short-lived moments we had lived together and the cruelty they experienced at the hands of Hutus. They say time heals all wounds but there is not enough time in the world to heal a wound this deep. At first, many things did not make sense in my 10-year-old mind. I could not understand why we, the Tutsi, were hiding, being murdered in cold blood and our houses being burnt down while our Hutu neighbors were just living a normal life. Going to the market, bars and even celebrating weddings. But I quickly understood one thing: that being a Tutsi, or at least being identified as such, was a terrible crime punishable by horrific death. I also realized that my parents and grandparents were guilty of this crime too – the crime of having been born. A crime against the very who we were. It all happened ruthlessly and efficiently – so fast. Checkpoints in every street intersection. Burning of our home. Hacking our cattle. Hate radio, RTLM, sensitizing the Hutus to ‘’work’’, Machetes and whistles. Hutu Militia Chanting: ‘’tubatsembatsembe’’ (exterminate them all), and our names were just reduced to Cockroaches and Snakes, only good for nothing other than being crushed on the head. At the end of three months of slaughter, my mother, my father, my three sisters including our 8-month old, my cousin, Ruzigana, who was home for spring break, my aunts, my uncles, and countless other family members were murdered. My cousin Kayitesi was in her last week of first pregnancy and her husband Ndamage were all exterminated and their unborn baby. My cousin Musabeyezu and all her two children and her husband, Habyarimana–No one survived to tell their stories. I will spare you the details of how the Hutus exterminated them. But I was there. And I remember everything. Although I was too young to comprehend the political machinery behind the genocide, I was old enough to realize its horrors. At the end of 100 days of extermination, 5 out of 6 Tutsis in Rwanda were decimated. 25 years, later, the memories are still fresh. 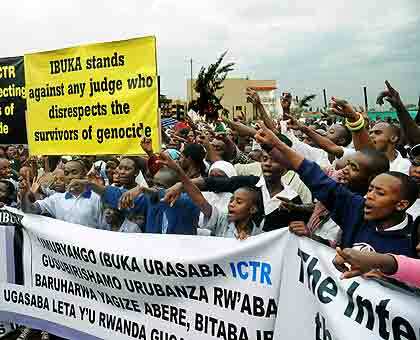 The genocide of Tutsi is perhaps a past. But it is a past that ultimately never goes away.